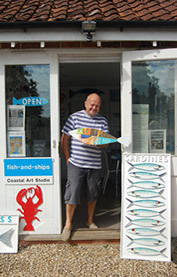 The gallery is open most days, but please check to see if the Fish and Ships swing sign is up in the drive, if not, do ring first , we would hate to miss you! To find Fish-and-Ships Coastal Art, turn into Ulph Place (opposite the Burnham Market Stores),walk up the drive and turn first right after the fence. Please use the contact form below to contact us with any questions or queries you may have, thank you.